Two major legal trends of recent decades have brought civil procedure within the purview of comparative law. First, the complex international legal relationships created by supranational and intergovernmental organizations often require practitioners to be familiar with legal procedures in other countries. Second, international treaties (particularly in the area of human rights) have encouraged the harmonization of procedural rules across national jurisdictions. 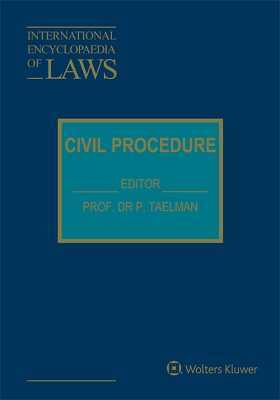 The Civil Procedure volumes of the International Encyclopaedia of Laws provide in-depth description and analysis of numerous domestic systems, guiding lawyers of differing legal backgrounds through foreign proceedings with which they and their clients may be confronted. National monographs describe the main features of each country's judicial organization, the rules governing the jurisdiction of the courts, the actual court proceedings, the rules of evidence, the principles governing preliminary seizure and the enforcement of judgements, and some elements of national arbitration. In addition, a forthcoming EU monograph analyses the European Convention on Jurisdiction and the Enforcement of Judgements in Civil and Commercial Matters (Brussels Convention of 27 September 1968, as amended), as well as the Conventions of Lugano and San Sebastian. An international monograph will deal with international multi-lateral treaties. Part I: Judicial Organization. 1. The Courts and Their Members. 2. The Bar. 3. The Bailiffs.Part II: Jurisdiction. 1. Domestic Jurisdiction. 2. International Jurisdiction. Part III: Actions and Claims. 1. Actions. 2. Claims and Defences. 3. Sanctions on Procedural Irregularities. Part IV: Proceedings. 1. Pre-Trial Proceedings (if any). 2. Proceedings in First Instance. 3. Review Proceedings. Part V: Incidents. Part VI : Legal Aid and Legal Costs. 1. Legal Aid. 2. Legal Costs. Part VII: Evidence. 1. Burden of Proof. 2. Admissibility of Evidence. 3. Administration of Evidence. Part VIII: Particular Proceedings. Part IX: Seizure for Security and Enforcement of Judgements. 1. Seizure for Security.2. Enforcement of Judgements. Part X: Arbitration. Part XI. Mediation. Index.